Matar Kachuri or Peas Kachuri which is also known as Koraishutir Kochuri in Bengali is one of the delicious breakfast with Aloor dum or Cholar Daal for Bengalis. 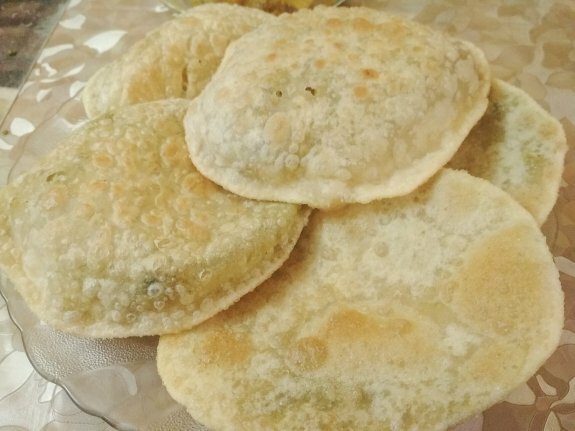 This is similar to stuffed Puri but not same as North Indian Kachuri. The taste of sweet and spicy flavour of peas stuffing gives an extra-ordinary taste to this recipe. 1. Take a bowl and add all purpose flour, salt and 2 Tbsp oil. 2. Mix everything well so that oil and salt incorporate with flour properly. 3. Add water in intervals to create soft and smooth dough. 4. Cover the dough with wet napkin or cloth and keep it aside for 30 mins at room temperature. 1. Take the boiled Matar or Peas in a grinder to blender. 2. Grind to a semi coarse consistency without adding any water.If you are not able to grind on your mixture, then you can add 1 tsp water. But better to avoid it. 3. Heat oil in a pan. Add asafoetida and ginger paste. Saute till the raw aroma removes from ginger paste. 4. Now, add all the spice powders one by one – cumin powder, garam masala powder and red chili powder. 5. Now, add the ground boiled peas, salt and sugar. 6. Saute for 1 to 2 minutes. Stir continuously otherwise the grounded peas will stick to the pan. 7. Add 1 tsp or as required besan and sauté for further 1 to 2 mins with continuous stirring. 8. Take the matar stuffing in a bowl and let it cool. 9. Prepare small balls from the stuffing and keep all aside. 1. Make lemon sized balls from the dough. 2. Take one ball and flatten it in your palm. Apply some oil to it on both sides. 3. Place the ball on the rolling board and roll it up to 3 inch diameter circle. 4. Keep the matar stuffing in the center. 5. Bring all the edges of the dough and press them together. 6. Apply some oil if required and roll the stuffed kachori to a circle of 4 to 5 inches circle. 7. Do the same process with rest of all the balls. 1. Heat oil for deep frying in a pan or Kadai. 2. Gently drop the kachori in the hot oil. 3. With a spoon, gently press the kachuri on the top to help it to puff up, like we do while frying pooris. 4. Turn the Poori and fry the other side of Matar Kachori. 5. When the Matar Kachori appears crisp and light cream golden, remove it from the oil and drain on kitchen paper towels. 6. Serve crispy and hot Motorshutir Kochuri or Peas Kachuri or Matar Kachuri or Koraishutir Kochuri with chutney or Dum Aloo or Cholar Daal or Dahi(Yogurt).